When the Fuzzy Five started in October, I didn’t know that it would go this long or that I’d ever reach back to the very first panel of the strip. But, thanks to our wonderful readers and the good folks at Squishable (go buy yourself a Breakfast! ), Melissa and I are still churning out comic strips for you good folks. Since we’ve now gone back to the “present,” it’s worth noting that the storyline as you’ve seen it takes some chronological leaps and goes back and forth between various plotlines. In my role as Keeper of the One True Fuzzy Five Canon, I will take this opportunity to fill in some gaps. - Though there was no Firefly musical, Claire was discovered by a casting agent at LAX and pitched the role of a young Sarah Palin in a TV movie. She declined. - I hear that since his appearance on the Fuzzy Five, notable Canadian Justin Bieber has become quite famous stateside. Good for him. - The charges against Breakfast were dropped after his attorney successfully convinced the arresting officer that he would tell his buddies from the Police Academy that he had been beaten up by a round, plush rooster. The attorney has yet to be paid. - Despite Dr. Liu’s efforts to dry her out and spot wash with warm water, Spirit still smells a little bit like lemonade. This isn’t an entirely bad thing. - Sunshine is still waiting for those Skittles. Panel 4 made me squee. It’s cute level is dangerously high! How exciting that we’ve come so far – I really hope Fuzzy Five continues, because it is one of my favorite things on the internet. There is indeed something irresistibly cute about Otto when he curls up his fistacles and squinches his eyes shut. lol @ “fistacles”. The >_< face is also adorable. otto haz an intense! Good job keeping this comic up, guys! I love it! X3 Finally, the show can actually START! …Sad to say, I don’t -quite- get that BASIC joke, despite that being the first programming language I ever learned at least a little of. The joke is that there’s no end to the program. 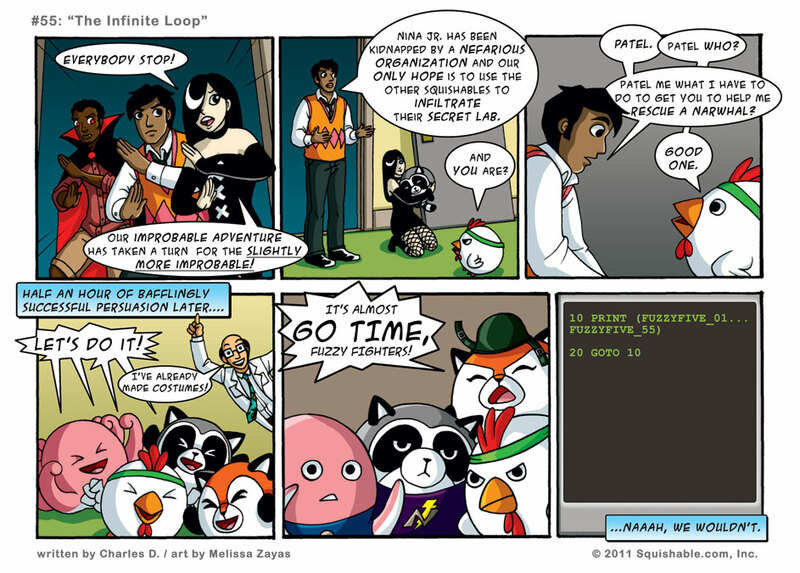 Line 1 makes the 1st-55th strips appear. In line 2, instead of “end”, it refers back to line 1, so the 1st-55th strips all over again (therefore, an infinite loop of strips 1-55). It’s kinda more of a pseudocode. Line 10 PRINTs comics FUZZYFIVE_01 through FUZZYFIVE_55, and line 20 goes back to line 10, leaving us recursing through the last 55 comics over and over. Confession: When I typed the number 10 in the first paragraph, I must have been thinking of capitalizing it, because I held down the Shift key and typed !). Also: hey, wait a minute! This is Fuzzy 5 55! Maybe the book version could have some kind of terrible EE pun in the comments or something. Naah, I’m not smart enough to make EE jokes. The BASIC-based pseudocode is the best I could do. However, I was quite the LOGO expert back in my day.